Cronenburg's latest is delivered to blu ray this week. It's a slow moving period piece that traces the tumultuous relationship between Carl Jung and Sigmund Freud. While it's not Cronenburg's strongest work, it's definitely an interesting drama that offers a dynamic look inside two of our greatest minds and a brief dramatized history lesson about the inner workings of these two manipulative men. The strongest point of the film is Keira Knightley's performance. This is the best dramatic performance of her career and an absolute break out for her as an actress. She finally sheds the Pirates franchise and moves in to new territory as a respectable figure in the dramatic arts. Her role is shocking, seductive, and an all around great performance. If for nothing else, watch it for her performance. 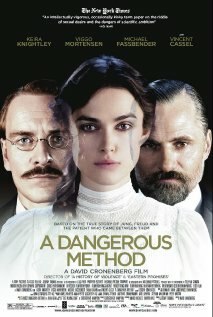 If you like Cronenburg films, you will undoubtedly like A Dangerous Method. It's a different type of film that definitely deserves a watch.